Action Lab has a lot in store for Free Comics Day. In addition to participating in the big day, the publisher will also be offering up their talent for appearances at various stores throughout the country. 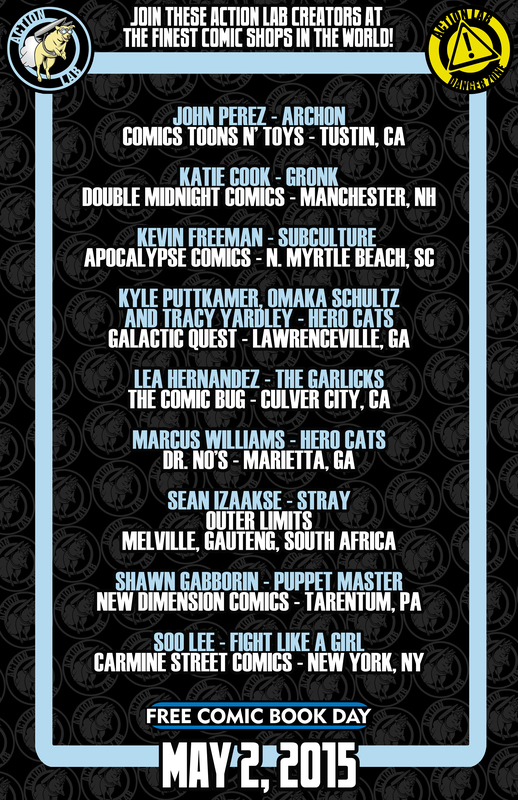 Of course, fans can also pick up the Action Lab Free Comic Book Day special, which will feature Hero Cats of Stellar City by Kyle Puttkammer and Marcus Williams. "We've always looked at Free Comic Book Day as an integral part of community outreach," said Vito Delsante, Associate Director of Marketing. "As a former retailer, Free Comic Book Day was always a hard day to work, but ultimately worth it when you see children of all ages coming up to get comics, for many their first one." Full press release and appearance schedule below. PITTSBURGH, PA - Action Lab Entertainment has released it's creator appearances for Free Comic Book Day, the annual event that encourages new and long-time readers alike to discover the magic of comic books. ALE creators as far as South Africa are scheduled to sign books, give away sketches and meet fans...all for free! Action Lab is proud to once again be a part of Free Comic Book Day with this years Action Lab offering, Katie Cook's GRONK. 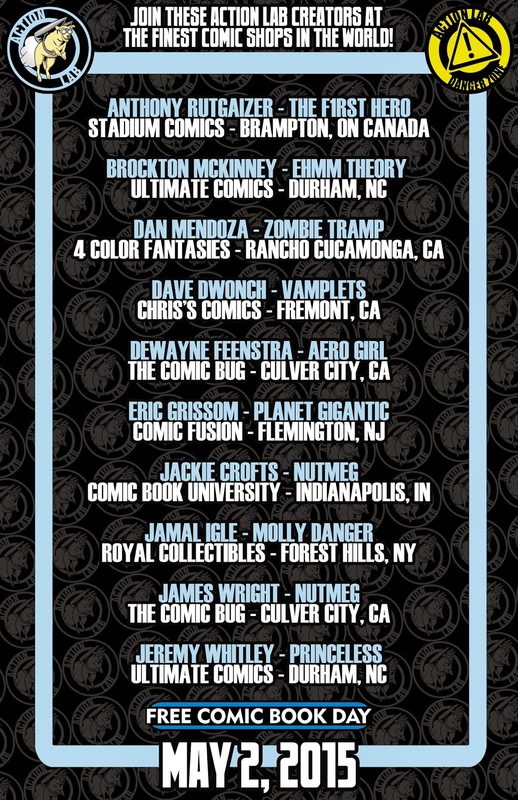 "We love FCBD at Action Lab and are extremely proud to work with retailers across the world to make the experience enjoyable for fans," added Vice President of Marketing and Molly Danger creator, Jamal Igle. "As a father to a burgeoning comics' fan, Free Comic Book Day is an opportunity for your readers to find their 'gateway comic'; the comic book that will hopefully turn them into a lifetime reader. It's also an opportunity for fans to meet some of their favorite creators outside of the comic book convention experience in a more intimate setting, which is always fun." Action Lab's free comic book also has a HERO CATS OF STELLAR CITY story by Kyle Puttkammer and Marcus Williams. The creative teams are available for interviews and promotional opportunities. For more information retailers can reach Vito Delsante at vdelsante@actionlabcomics.com. Press and conventions can reach Jamal Igle at jigle@actionlabcomics.com. ABOUT ACTION LAB ENTERTAINMENT- Formed in 2010 with the purpose of pooling their collective talents into a single, powerful entity, the members of Action Lab Entertainment have countless years in multimedia publishing, design, and business. Their first release, Fracture, was successfully funded through Kickstarter and since then they have continued their mission to produce high quality, genre-spanning entertainment. Since its formation, the accolades for A.L.E continue to build on a daily basis. Among its more popular titles are all ages material like the Eisner, Glyph, Shel Dorf Award nominated series PRINCELESS, NFL RUSHZONE (based on the Nickelodeon Television series), Jamal Igle's MOLLY DANGER, Artist/ Writer Jeremy Dale’s hit series SKYWARD, and Gayle Middleton’s (My Little Pony, The Littlest Pet Shop) monstrously adorable VAMPLETS. Action Lab’s Mature Readers imprint ACTION LAB DANGER ZONE continues to push the envelope of comics entertainment with titles as varied as EHMM THEORY and Dan Mendoza’s over the top horror-comedy ZOMBIE TRAMP, THE FINAL PLAGUE and BO, PLUSHY GANGSTA.